...On the contrary, I don’t think any of us know anyone anymore." a large tropical butterfly, the male of which has bright blue iridescent wings. Native to the Central and South American rainforests, large numbers are caught each year for use in the jewellery trade. Small-town Oregon, 1989. After a sixteen year old girl disappears and the local police department reach a dead end, a series of accusations descends on the secret-ridden corridors of Grove River High School. When the spotlight falls on the missing girl’s older sister, it becomes clear that this may be far beyond a simple missing person’s case. 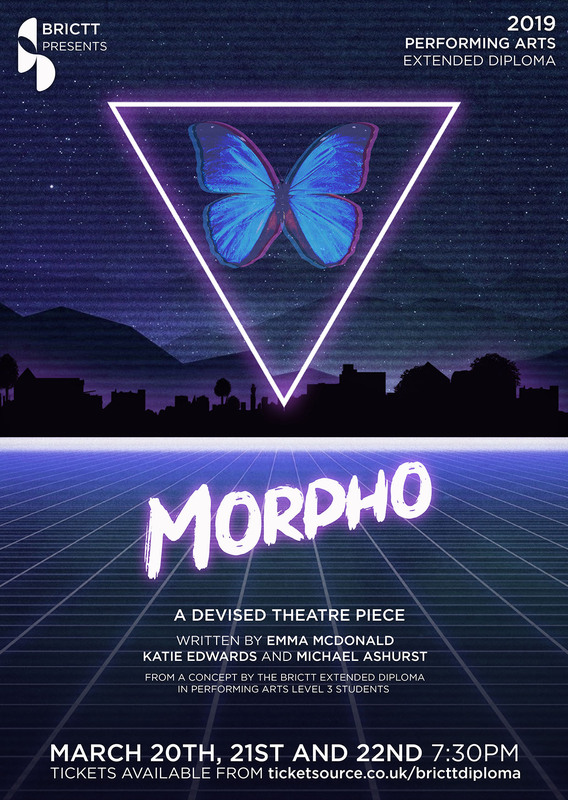 Morpho is a tale about what happens when we lose the ones we love, the search for truth, and the terrible prices we sometimes pay in order to find it. Morpho was developed from scratch by the Level 3 Performing Arts Extended Diploma company in response to stimuli related to 1980's fantasy/sci-fi-adventure cinema and features a script by Emma McDonald, Katie Edwards and Michael Ashurst from an original idea by the company, choreography and staging by the company and design by the company. Morpho represents the completion of the Level 3 Final Production unit.